Develop and execute better business strategies. Develop and execute strategy using the most popular strategic frameworks. Share projects with your colleagues and see each other's updates. Access all of your projects from any computer or tablet you can connect to the Internet. 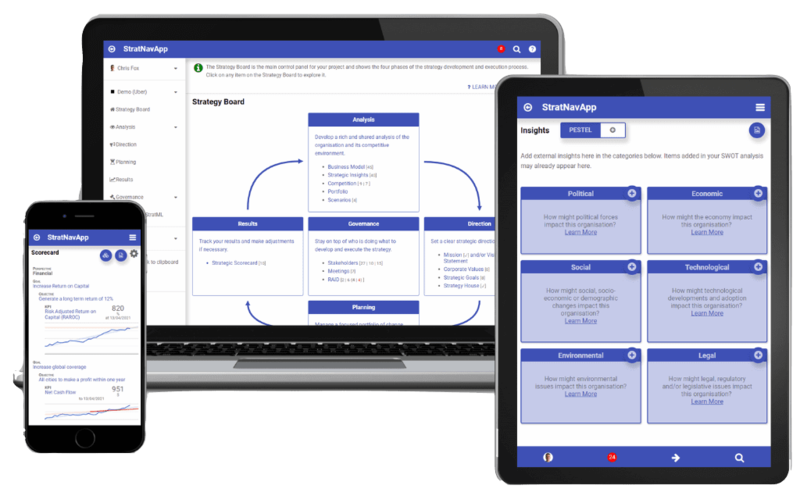 Manage all 4 stages of Strategy Development and Execution in one place, from anywhere, on any device. Use governance and control to ensure your strategy delivers the intended results, and make adjustments where required. Control the execution of your strategy using a RAID Log. Track your KPIs on a graphical Scorecard. Feed the results back into your analysis. Strategic goals, objectives, KPIs and targets in each of the 4 perspectives of the Balanced Scorecard. Balance your key initiatives across the 3 Planning Horizons. Manage your initiatives through the evaluation, prioritisation and approval cycle. Agree costs and benefits, relative to your goals. Map you initiatives against your goals to confirm alignment and completeness. Personal Calendar: see all your meetings across all your projects. "StravNavApp is really a great solution. The real value is that it forces you to think through the problems, you’re not just recording data." "A very intuitive tool for my students at a masters course for Business Strategy." StratNavApp is committed to the improvement of strategic decision making at all levels. We will never spam you or sell your data.